NAVY Color Medallion Handsome 2" service medallion cast in brass and hand finished in brilliant enamel. Smooth back makes your medallion perfect for mounting, engraving or using as a paperweight. This medallion is a must have for any proud Veteran. 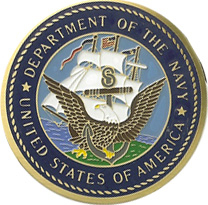 Navy NAVY Color Medallion - The Navy Medalion will look great in any display case, or any military Frame.